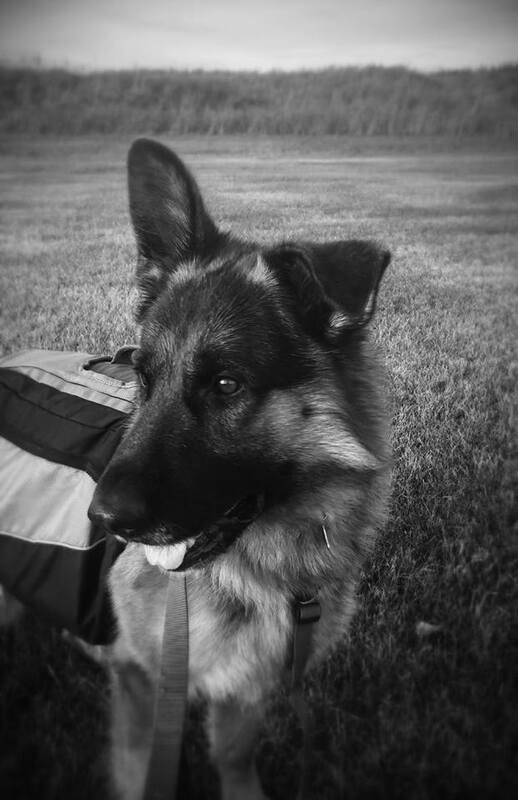 Elhart K-9’s has been approached several times in the last several years in regards to helping out homeless and abandoned German Shepherds, whether they are purebred or crosses. Up until December 2012, we did not have the room for helping out in this area and regretfully had to say no to these dogs. We however, decided this was something that we would have to make room and time for, these dogs needed someone standing behind them and help them get to a place where they could be placed in a forever home. We are a foster home only and are currently working in conjunction with the Brandon Humane Society and Winnipeg Humane Society. 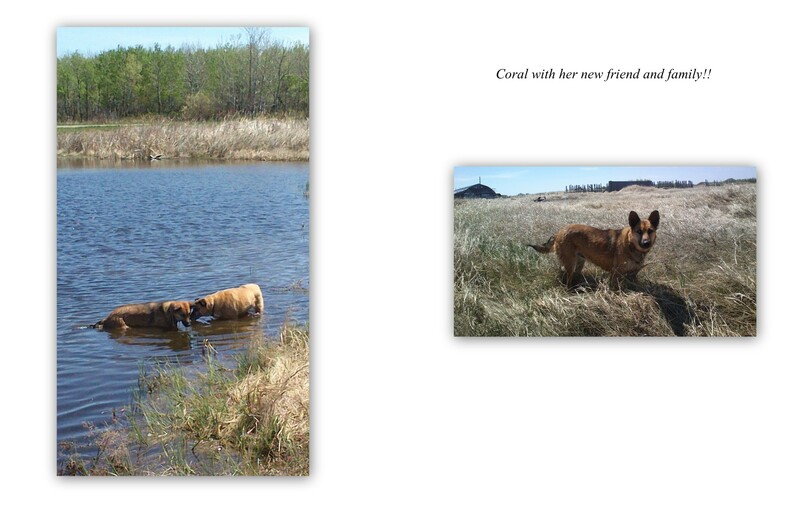 Paige came to Elhart by request from The Winnipeg Humane Society. She had some behavioural issues stemming from her past home so is currently working on several training exercises and is coming along nicely. She will be available once training is complete and she is consistantly offering good behaviour. Paige does very well with car rides, house trained, and is not dog aggressive. She used to live with cats and does not appear to have much prey drive. She loves kids and interacts in a friendly manner to strangers. Currently working on off, leash, collar, stay exercises. I was approached by a family to help find Gunner a forever home. He is West German/American lines purebred German Shepherd but not registered. 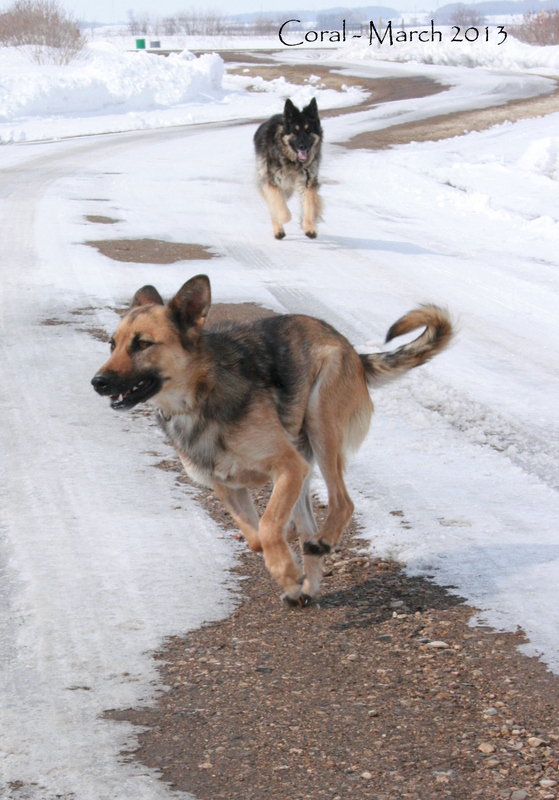 He is not from Elhart K-9’s breeding program. I am providing him boarding and training as well he is spending some time in foster care. He has been raised around babies and kids and is good with people of all ages. 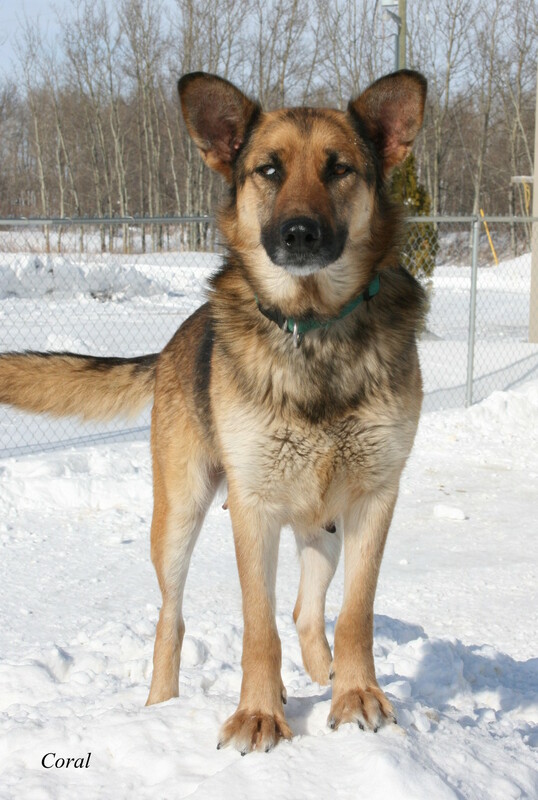 This mom, Coral, is a shepherd x and her along with her 9 pups had been abandoned in a fire damaged trailer in Northern Manitoba. These puppies arrived at 4 weeks of age, malnourished, full of worms, and covered in jam from rummaging through any garbage they could find for something to eat. These pups were going to be thrown out into -40 degrees C with the wind chill in January as the trailer was scheduled for demolition. A kind gentleman contacted the shelter and well, the rest is history! Unfortunately, we lost one of the male puppies two days after arriving due to worms. On a brighter note, we were able to help out in time so the rest of the litter could get the proper vet care and nutrition that they needed. After arriving, these puppies thrived. They learned how to interact with our dogs, kids, and all adults, noises, manners, etc! The mom blossomed as well as she learned basic manners, crate training, socialization, and just received all the love and attention that she deserved. A happy ending for Coral as she starts a new journey with her family! She has settled in very nicely and I am so pleased to be able to visit and see her happy and the joy she brings to her family!